The game started quite even with Doncaster passing the ball around nicely with the wind to their backs on a good 4g surface. Our girls were holding their own though with some tough defending from Miley, Ayla and Livvy and some great saves from Alex between the posts while looking to hit Doncaster on the break. The breakthrough came mid-way through the half with a goal from Evie, the girls were unlucky not to double their lead after a fine chip from Emily struck the post. The 2nd half started with the Owls well on top , Doncaster had plenty of ball in midfield but never really looked like scoring mainly due to some great play from Elisha, Neive and Georgia, further chances came and went for our girls to extend their lead without success. The final whistle came and it was victory for our girls by just the 1 goal, it made a change to see a good battle between 2 evenly matched sides. Our U10’s will have to wait until next week to see if they are through to the knockout stages or entered into the Plate competition. After last week’s great win our girls lost 5-0 to a very strong Bessacarr team. There is still one game to play in their group so its still all to play for. Of all the games I have watched the girls play, I can definitely say today was the coldest. The girl’s faces after the match showed that they definitely felt it and I’m sure it would have affected the most seasoned of players. The weather aside it was another great game between two fantastic teams. The score doesn’t do the game justice. Penistone were far better than the result shows. Our first goal came in the first half from a fantastic bit of football from Matilda Rodgers. After Penistone equalised in the second half, Matilda was again involved in our second goal just minutes laying off a pass to meet the well timed run of Evie Gillett who tapped the ball passed the keeper. Penistone came back several times which tested the solid defence of Lucy Philips and Eva Lane. A break from the girls led to a scramble with the ball eventually falling to Matilda who hit a solid strike and scored her second goal. Credit to Penistone church who are by far the nicest bunch of girls we have played and I’m sure all the parents will join me in wishing them well in the plate competition. Our U12’s passed comfortably into the draw for the next round after their 6-0 victory over Crosspool Junior Green. They led 2-0 at half time before scoring a further 4 goals and also keeping a clean sheet. Scorers: Millie Stephenson (3) Ella shaw (2) & Aaliyah Whitworth. Also scoring 6 goals were our U13’s in their game against Chesterfield. The game finished 6-1 with 6 different players on the score sheet. The girls are looking forward to the draw for the next round which takes place at the SHGCL league meeting this Thursday. Scorers: Alisha Attwood, Lily-Mae Beevers, Brooke Betts, Maisie Langley, McKenzie Scott & Madison Wilson. A tough game on paper awaited our U14’s who hosted league leaders AFC Pogmoor at Bawtry road. The last league game was won 5-2 by Pogmoor. The opposition again started the stronger of the two teams and took a 2 goal lead before our girls got one back just before half time. Our lot stormed back in the 2nd half and made it 4-2 before a late 3rd goal for Pogmoor meant a close end to the game but its Neal and the girls who progress into the next round. After facing the same opponents last week and not being at our usual standards we challenged the team to return to their disciplined, structured football. 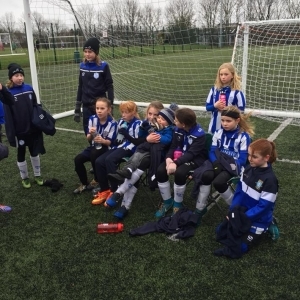 Considering the condition of the pitch the girls did this tremendously and were comfortable from the start with goals from Millie Simms (3), Charlotte Howe (2), Delia Hurdiss (2), Clara Miller (2), Jessica Sutton (2) Kayha Williams and the first of the season for Jade Rennie Campbell. A clean sheet for Skye Mara too and an extra praise for Alivia Chambers who covered 6 different positions today, including 15 minutes in goal.